DON'T DO IT! DON'T DO IT! IN THE NAME OF ALL THAT IS PURE & GOOD, DON'T DO IT! 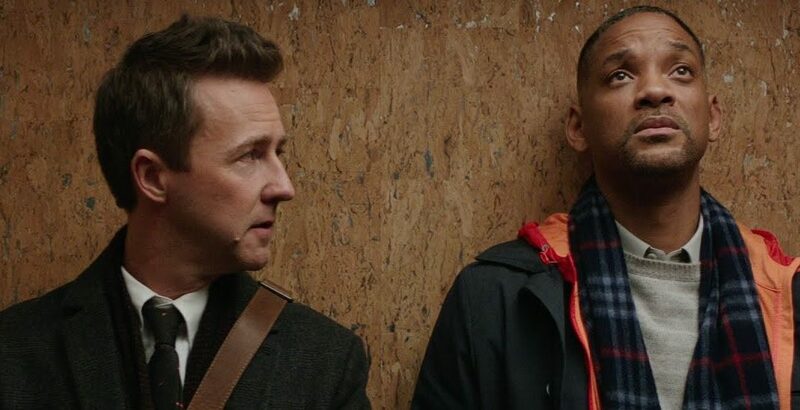 Collateral Beauty is perhaps the worst film of 2016 (and I say this as someone who endured such horrors as Batman vs. Superman: Yawn of Justice, Ben-Hur and Independence Day: Resurgence). On second thought, Collateral Beauty IS the Worst Film of 2016, bringing Will Smith yet another lousy film to add to an already dreadful run of this once-unassailable star (Seven Pounds, Focus, After Earth, and other Smith film of 2016: Suicide Squad, which would have joined Collateral Beauty in the Worst of 2016 if not for his Focus costar Margot Robbie's great performance as Harley Quinn). 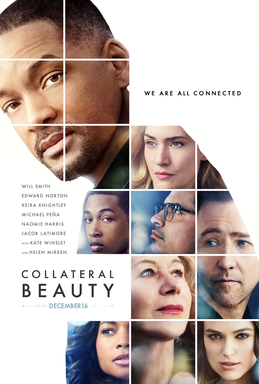 Collateral Beauty started out with an interesting concept, then tied itself up in knots trying to be too clever with its ideas, becomes more and more frustrating until it gets to a final 'twist' both predictable and flat-out insulting to those who haven't already walked out that I wouldn't be surprised if people threw popcorn at the screen for such an appalling piece of pseudo-philosophical trash as Collateral Beauty. Howard Inlet (Smith), once an advertising wunderkind, is now a shell of a man, building large domino sets that after finishing, he knocks down (oh, the symbolism). He's still grieving the death of his daughter, and while it's been two years in the past six months he's turned into an even bigger zombie. His three partners/friends Claire Wilson (Kate Winslet), Whit Yardshaw (Edward Norton) and Simon Scott (Michael Pena) are concerned, and not just for him, but for their company which is sinking thanks in large part to Howard's moribund world. They all want to sell the company, but Howard has controlling interest and can't be approached on anything. Whit then spots an actress auditioning for a commercial at the ad firm, and an idea sparks into his head. Earlier, the three had discovered through a detective (described as looking like a Mormon grandmother) that Howard had written and posted three letters to Death, Time and Love. Using this info, the three other partners decide to hire actors to impersonate Death, Time and Love. These actors will talk to Howard and later their conversations will be videotaped (with the actors edited out) to make people think he's gone mad and is mentally unfit to make financial decisions. I guess because mailing letters to Death, Time and Love isn't already a bit kooky in and of itself. The three actors hired are Brigitte (Helen Mirren), who will play Death, Raffi (Jacob Latimore), who will play Time, and Amy (Keira Knightley) who will play Love. Amy is the only one who isn't keen on this idea, but they need to fund their experimental play, so there it is. As it so happens, this group of thespians and advertising executives do a form of tag-teaming. Coincidentally, Death is paired with Simon (who happens to be secretly dying). Time is paired with Claire (who is running out of time to get pregnant). Love is paired with Whit, who is attempting to reach out to his rich (and dare I say, bitchy) daughter after his affair broke up his marriage (the fact that his ex married wealthy while he has been forced to move in his with his dementia-slipping mother I'm sure doesn't help). Let me mark out, 'coincidentally'. Keep adding. Eventually, the doctored videotapes are shown and Howard agrees to go. Each of our other three ad executives deals with his/her own issues, and Howard also finally admits who his daughter is...and who his ex-wife is. I won't spell it out for you, but here's a hint: Howard and Madeleine both lost their daughter at the same age from the same disease. And adding a coda to the fiasco, Brigitte, Raffi, and Amy aren't really actors. I freely confess being angry, just angry when Collateral Beauty ended. It took all of me to not throw at the very least my pen at the television screen. It is cheap in that it relies on simply too many coincidences, too many implausibles, and by going beyond deliberately misleading the audience into downright lying to them. The trailer suggests one type of film, the actual movie we get is almost totally removed from the story audiences are led to believe. For the longest time I hanged on to Collateral Beauty, even as I saw the wheels coming off. The film was determined to get to its destination point, even if that destination was nowhere. You could see where the film was going when 'Death' works with a dying man and 'Love' works with a man having love problems. It's all so predictable, so obvious that you keep thinking, 'no, we'll get a real twist that will rectify this'. You don't. Then we get the actual ending of Collateral Beauty, with something that had been building up but that you think, 'no, you won't go there. Not only is it too obvious but it would be laughable, and even insulting to mislead your audience even more'. Yet, that's what Allan Loeb's script does: go for something obvious and idiotic. MASSIVE SPOILER HERE. SKIP THIS PARAGRAPH IF YOU DON'T WANT TO READ IT. I kept saying as the film wrapped up, "Please don't make Madeleine Howard's ex...please don't make Madeleine Howard's ex..." And then they did, and I officially gave up on Collateral Beauty. Already having Brigitte, Raffi and Amy LITERALLY be Death, Time and Love was just about intolerable, but that last twist...no, that's unforgivable. Poor Will Smith. He's floundering in these self-serious, self-important Oscar-bait films searching to find both audiences and awards. His performance here is so like that in Seven Pounds: yearning to pull at our heart but giving us little to nothing to make us feel. Unlike Seven Pounds (or at least my memory of Smith's other effort at 'deep philosophical meditations on Death, Time and Love), his scenes didn't elicit drama. They were at times almost comical in how hard he and director David Frankel tried to show deep grief. There's a scene between Whit and Howard where Whit is trying to talk to Howard about the danger their company faces. Howard has essentially become a mute (for at least the first twenty to thirty minutes in Collateral Beauty Smith doesn't speak). As Whit continues to talk about the seriousness of their situation, Smith just nods his head, moves his throat to 'say' 'mm-hum', and stares at him, as if Whit had suddenly slipped into speaking Urdu to him and he's just trying to be polite. The whole thing is unintentionally hilarious, but a pretty accurate image of how self-serious Collateral Beauty is. The fact that everyone is trying so hard to be serious in a film ripe for parody (one that in better hands might actually be parody) makes everything more unintentionally hilarious. And it isn't as if the performances are bad. Mirren, Harris, and especially Pena are taking this whole thing seriously (though Mirren as the batty actress at least has a chance to show some humor). Pena in particular should be applauded for showing a wider range (and the film should get kudos for letting a Hispanic play a non-Hispanic role, though how he wouldn't understand the Spanish-language commercial and Whit would is a bit curious). Norton, Winslet and Knightley are a little more rote, but better than Smith, who should fire his whole agency and look for roles that challenge him but don't cash in on what's bee done before (Bad Boys franchise anyone). Collateral Beauty tries to be too clever by half and only ends up looking more idiotic than one would have thought. The twists are at times too silly to be believed, and despite good work by most of the cast the thing is such a misfire. There's no Beauty, but a lot of Collateral.